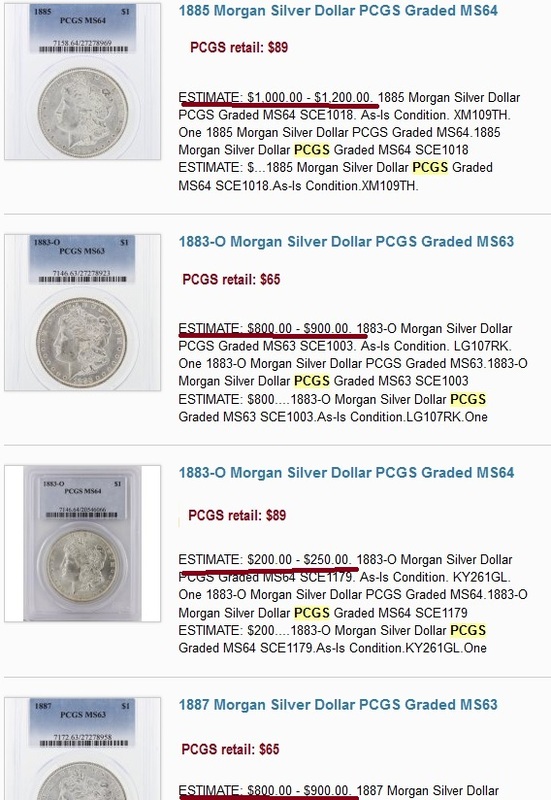 The real entertainment is below, in this series of PCGS lots, when the auctioneer puts values that not only can be checked against PCGS retail ones but also defy logic, with lower grade 1883-O MS63 Morgan priced at $800-900 and the same coin at MS64 priced at $200-$250. 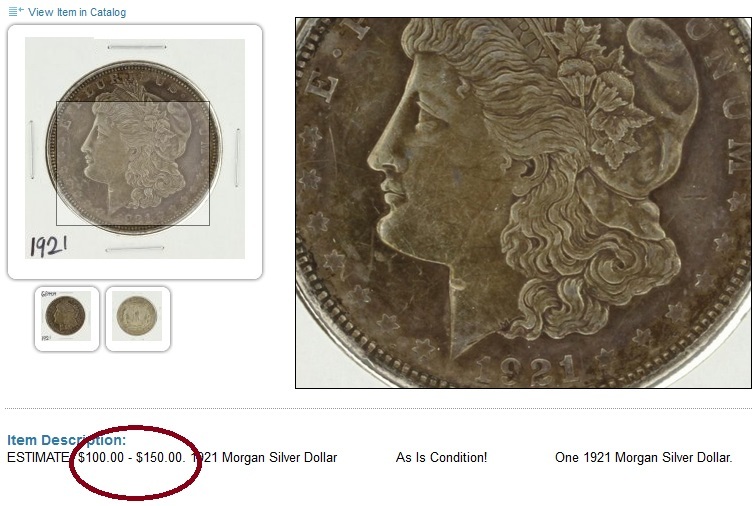 Click the photo to expand and see the auctioneer’s values vs. PCGS ones. Entertainment value aside, someone at Proxibid needs to address this in the Unified User Agreement. Auctioneers cannot just make up values as if coins are jewelry, where anything goes. These are US Mint products, and PCGS’s reputation–the best in the business–is tarnished when a Proxibid buyer purchases a $65 coin for hundreds more than it is worth and then learns the true value when trying to sell it. We strongly recommend, as we have done many times in the past, that bidders and auctioneers on the portal subscribe to PCGS CoinFacts to learn the latest auction prices (including eBay) for holdered coins by top companies PCGS, NGC, ANACS and ICG. This entry was posted in Best Practices and tagged American Numismatic Association, Auctioneers, AuctionZip, Best Practices, Coin Auction, iCollector, National Auctioneer Association, PCGS, PCGS Coin Facts, Proxibid, Proxiblog. Bookmark the permalink.